Teen golf sensation Aditi Ashok scripted history on 14.11.2016, as she became the first Indian woman to win a Ladies European Golf Tour title by clinching the Hero Women's Indian Open at Gurugram. The 18-year-old Olympian held her nerve to get the better of American Brittany Lincicome and Spain's Belen Mozo. Aditi won a prize purse of 60,000 dollar, propelling her to the top spot in the Rookie of the Year rankings. Aditi Ashok (born 29 March 1998) is an Indian professional golfer who has qualified for the 2016 Summer Olympics. 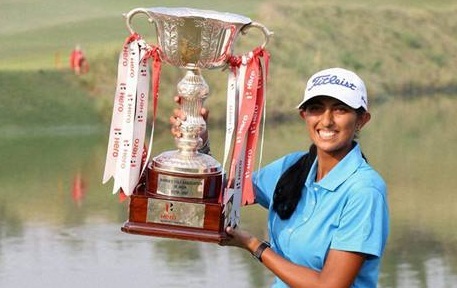 Aditi made history be being the youngest and first Indian to win the Lalla Aicha Tour School and therefore secure her Ladies European Tour card for the 2016 season. This win also made her the youngest winner of a Q School for an international tour. Aditi is the first and the only Indian golfer who played the Asian Youth Games (2013), Youth Olympic Games (2014), Asian Games (2014) and Rio Olympics (2016).